If you've a sweet tooth, KL can be heaven or hell, depending on whether you're in indulgence mode or steering clear of all seven of the deadly sins. 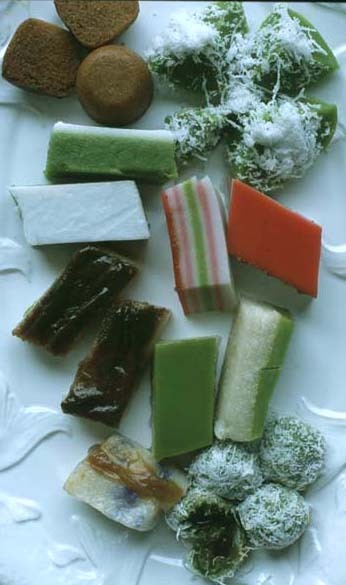 Temptation - in the form of an endless array of multi-hued, variously shaped and textured sugary kuih (lit. "cake") - lurk on every corner, peddled from mobile carts, sold by generously-girthed, smiling mom-like ladies seated behind folding tables outside grocery store entrances, hawked at permanent stalls in coffee shops, or served in air-conditioned comfort at shops in any one of KL's numerous shopping malls. For the ten years or so prior to moving to KL, I was a once-a-month-or-so sweets consumer. All too aware of the dangers posed by a half-finished cake or a tin of cookies sitting on the kitchen counter, I don't often bake at home (the pound of Valhrona bittersweet chocolate I purchased two months ago to make a flourless chocolate-black pepper cake is still sitting in fridge). And I rarely order dessert at a restaurant (vacations being the exception), preferring to devote my calories to delectable savories and good wine. But living in KL has posed a challenge. Malay sweets, with their coconut-y richness and haunting palm sugar complexity, have thrown a monkey wrench in my attempts to "stay clean". The weekend before last was a bit of a disaster. First, on Saturday, there was the kuih seller outside Restoran Fook Yun. The little lovely pictured up top consists of two thick layers of rice flour, coconut milk and sweet corn (yellow) sandwiching a thin layer flavored with coconut milk and pandan leaves. I love, love, love sweet corn - but not in a dessert, so I approached this kuih with a bit of caution. In this instance though, it worked, the corny sucrose seeming very at home with the coconut. Then there was the kuih ketayap (or kuih dadar) sold at the Aroma Nyonya Kueh stall at Chun Heong coffee shop in Bangsar's Lucky Garden. This is, without a doubt, my very favorite kuih. 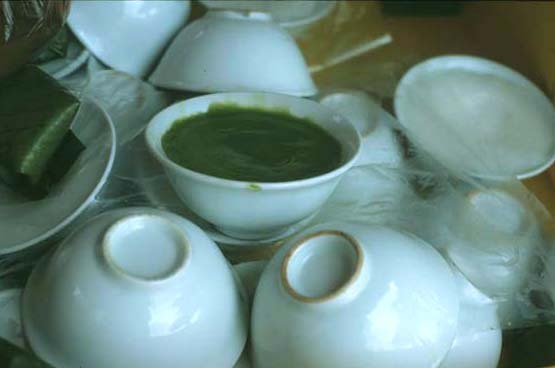 Soft, spongy pandan-flavored pancakes enclose a filling of grated coconut and palm sugar. There's nothing quite like a kuih dadar hot off the griddle, when the pancake is still warm enough to soften the palm sugar. But a well-made dadar will stand the test of hours, its wrapper remaining supple and yielding long after the treat has cooled. Then we stepped into the abyss, deciding on the spur of the moment to check out the offerings at this kuih cart that parks outside Nam Chuan coffee shop every Sunday afternoon. 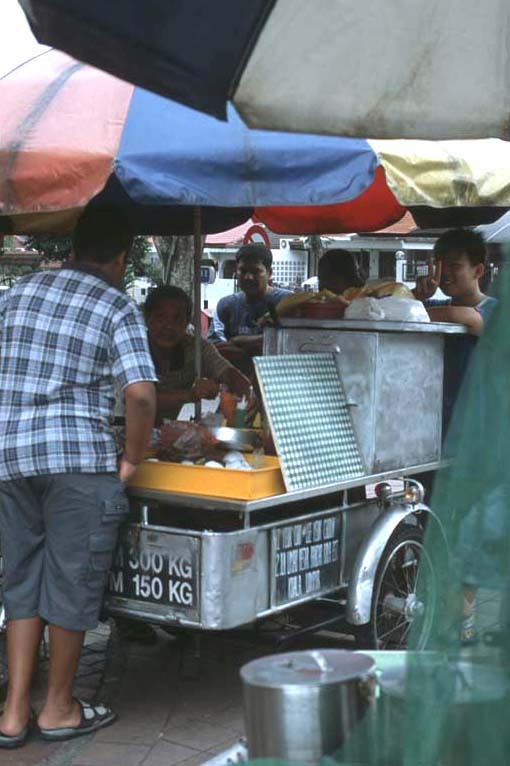 The cart was mobbed and our wait was substantial and tortuous, as I watched the supply of kuih dwindle. Happily, there was plenty left when our turn rolled around. and kuih apam (not-too-sweet spongy brown cakes lightly flavored with palm sugar --I imagined them as part of a delicious trifle, sliced and layered with strawberries and vanilla ice cream). Clockwise from upper left (readers, thanks for providing correct names! ): kuih apam, kuih kosui, kueh lapis, kuih seri muka (a cake of glutinous rice cooked with coconut milk, topped with a pandan layer), onde onde (Dave's fave - steamed pandan flavored glutinous rice flour balls with a semi-liquid filling of palm sugar, rolled in grated coconut), a "sandwich" of pulut tai tai (coconut and glutinous rice flour cakes that traditionally get their blue hue from a dye obtained from dried bunga telang, or butterfly pea flowers) with a kaya (rich coconut and egg "jam") filling, a coconuty kueh with a wrinkly "burnt" topping of palm sugar, and kueh talam (a layer of rice and green pea flour flavored with pandan topped with a layer of rice flour and coconut cream). This was not a typical weekend, but I think it's pretty obvious that I am no longer master of my sweet tooth. I may require detox. You have pictured here some of my favorite varieties. Coconut milk makes the kuih aromatic and delicious but sugar is an important ingredient. 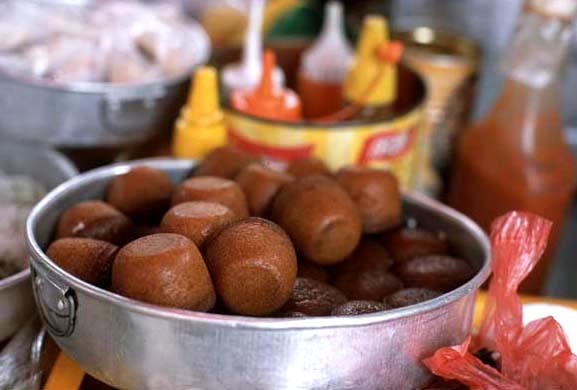 Apart from those in the photos, there are varieties where red beans, corn and many other ingredients that make eating kuih a most wonderful adventure! Mmmmm, kueh! Thanks for all these delicious images! Agree on nonya kueh being the best, particularly those from the north (penang, kedah etc.) 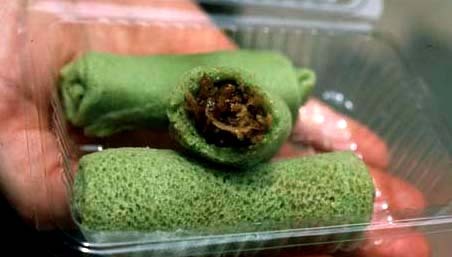 Have you found kueh-mueh from Malay vendors to be significantly different from Chinese kueh? Here's a link http://www.shiokadelicious.com/shiokadelicious/2004/06/kueh_kueh_kuih_.html#more to Renee's (of shiokadelicious fame) post on Singaporean style kueh. Great pix and commentary but I have to say I much prefer Malaysian-style nonya kuih. Completely different animal even though they look very similar. I do miss all that wonderful kueh - only kind we can get here in SF is the Vietnamese variety. Again, a different animal. 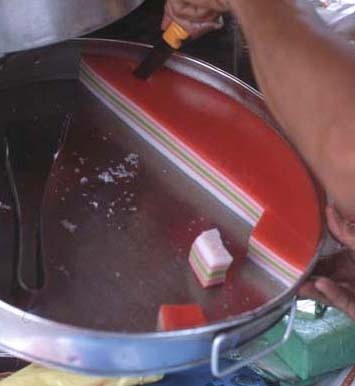 Have you ever consider making any of the kuih yourself? Bayi -- I can't take much credit .. I usu. work off of recommendations (Malaysians are so generous with directing us to their faves) ... and go where the crowds go. I know it must be possible to find bad food in KL, but I just don't know where! Sue -- thanks for the kuih-ducation! Will head back and correct my post now! Mary -- I never took a shine to Vietnamese sweets, I must admit. So it was pretty easy to stay "on the wagon" while we lived in Saigon. If you are serious, I can get recipes from my mum (from north Msia - Penang/Kedah). I love nonya kuih - especially kueh dadar. But really, anything glutinous and coconutty is good to me! Heyas! Ack, Kuih is the staple Sunday tea at home. I'm studying in India now, So I really miss all this. I like how the traditional kuih category has expanded to include modern kuih. for example, a popular kuih during Raya is "Kuih Batik" named for it's catik like appearance. The chief ingredients are Marie biscuits and Milo, and it is delicious! 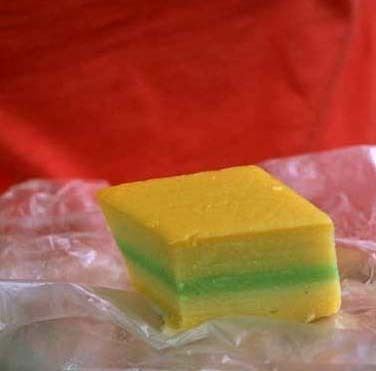 Can any1 pls send me a recupe of kueh makmur before hari raya n other delicios delicacies....thx. Hi, does anyone have receipe for kaya, pulut tai tai, and onde onde? Aha! I know that kuih seller outside Nam Chuan. He's the best! My family has been frequenting his stall for the past decade or so. Hi! Does anyone know the name of the tapioca kuih (yellow in colour with brown crust on top) and its cousin, white in colour with brown crust? These kueh are totally making me drool.. I'll have to try the kueh dadar next time I go back to Malaysia, they look really yummy.. if only we could buy them in Sydney! I am a Malaysian who lives and work in the UK for 36 yrs and totally starved of nyonya kuihs. Where is Nam Chuan Kopitiam and that Rest. Fook Yun? Thanks for recommending. Will start hunting them tomorrow. Muaahhhhahahaha!!!! I would like the receipe for seri muka and onde onde please. 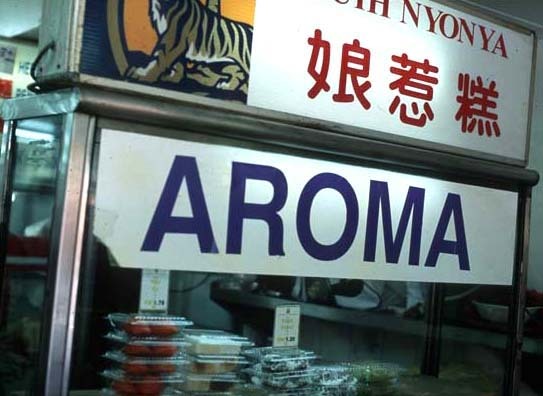 I am so very proud of my cousins (Aroma Nyonya), they always strive for excellence in their kuih.